Louisville, KY (October 21, 2013) – The deadline to nominate Kentucky teachers for the 2013 Excellence in Ag Literacy Award is now less than two weeks away. The award, bestowed annually by Kentucky Farm Bureau (KFB) during its annual meeting, was established to recognize and reward teachers who excel in their efforts to incorporate agricultural concepts throughout their core academic studies. Nominations must be received at the KFB state office by Friday, November 1. 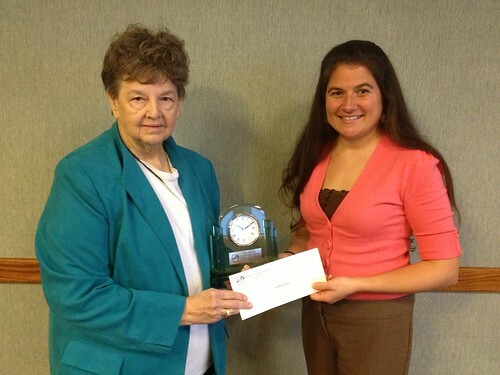 Contessa Harris (right), pictured with Phyllis Amyx (left), received the 2012 Excellence in Ag Literacy Award. All certified pre-kindergarten through 12th-grade teachers who are engaged in integrating agricultural concepts into non-agricultural curriculum are eligible. Self-nominations, as well as nominations from school faculty, community leaders or parents, are encouraged. A downloadable nomination form, complete with program guidelines and evaluation criteria about the Excellence in Ag Literacy Award, is available through the KFB website, kyfb.com/federation. The winner of the award will be announced on Friday, December 6, during the KFB Annual Meeting at the Galt House in Louisville. In addition to statewide recognition, the winning teacher will also receive $500 and an all-expense-paid trip to the National Ag in the Classroom Conference in Hershey, Pennsylvania, June 23-27, 2014, where he or she will represent Kentucky in the national competition.